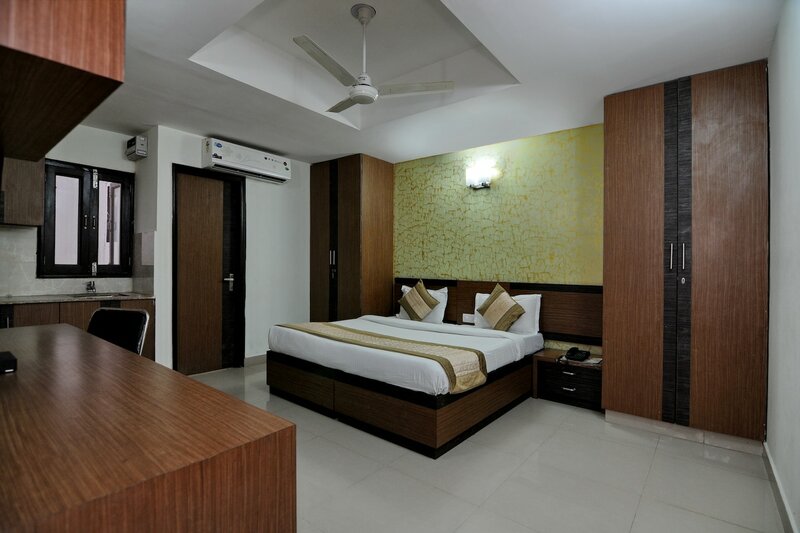 Hotel Le Tara Residency is a modern affair with large and well-designed rooms, located in Dwarka, Delhi. It is very close to Dwarka Sec 12 metro station. Some places of interest near this hotel are Isckon Temple Dwarka, Dada Dev Mandir and Sulabh International Museum of Toilets. This hotel has an elevator on the premises for the comfort of guests. The rooms are very spacious, feature neat wooden furniture and have wallpapers. Large windows bring in ample natural light. The bathrooms are neat and modern as well. Each room here comes with free Wi-Fi, AC, TV, seating area, and the bathrooms have geysers. Parking facility, laundry service, power backup and CCTC coverage are offered. Nearby eating joints include Poku, Deez Biryani and Kabab, Men in the Kitchen and Filmy Cafe.